much love, illy: CLOSED - sponsor love + giveaway with Le Mode Accessories. love the geometric statement necklace!! i'm a follower of your blog via gfc! the Neon Hue Ring really caught my attention! 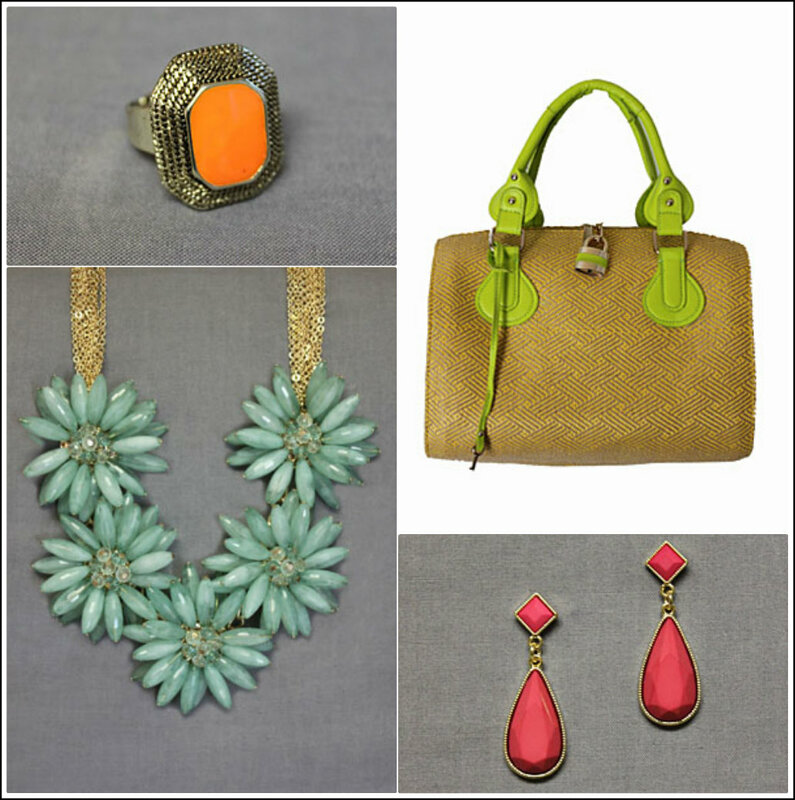 I would love to get either the orange you sweet satchel, the peachy keen bangles or any of the clutches they have! Such a great shop. And I followed both of you on twitter! i love the White Hexagontle Steps Earrings! i follow this blog via bloglovin. I would get the Diamante Azul necklace. I already like Le Mode Accessories on Facebook and left a comment on their page. Oh my god. The statements of lace necklace in aqua. I'm dying. Liked Le Mode on FB! I like the "Love Notes Clutch"
following Le Mode via twitter! LOVE the statements of lace necklace in aqua. Love the clutching together clutch..thanks for the chance to win! I would probably use it for the Rose Meets Rose Scarf. It's so pretty! Follow both of you on twitter! 3 winners!? this is awesome sauce!! i love the Point Chic Necklace in Cobalt!!! love the Descanso Garden Necklace in Orange! The Abstracted Pieces Necklace is stunning! I publicly follow your blog on GFC. i love all of their handbags the Wanderous Journey Messenger might be my fav. Sweet giveaway! Love the "love all around" necklace! Hi Ilene! I'm crazy about the decadent blooms necklace - I wish they had a version in coral. In addition, I'm a GFC follower of this blog! What a great shop and giveaway girl! I am desperately in need of a new purse so I'd probably have to choose one of their many lovelies. Perhaps something in mustard yellow? I follow you on GFC of course. I also follow on Bloglovin and it's my fav way to read! I follow you on the twitter and we rock as tweety friends! I sent them love from you (and me!) on facebook!! Fingers tightly wound together. Would love to win the Love Letters Ring in Silver, so cute. I love the Contemporary Pendant Necklace in Black and the Noir Essence Ring.. I'd get a clutch or maybe the geometric statement necklace. i think I'd go for a bright pop-of-color clutch! id want to buy the new mexico blues scarf! so pretty! commented on and liked le mode accessories fb page! im a GCF follower of your blog! i follow this blog via bloglovin'! I love the Blossom Beauty ring. i liked Le Mode accessories fb page. I would use my GC for the One w/ Nature belt and the Rosalina belt. I am a public GFC follower of this blog. I am a follower via bloglovin'! I follow @muchloveilly & @shoplemode on Twitter. I would buy the Depths of the Sea Necklace. I went to their shop. I love their Sandy Dune bracelet and the Glistener Wrap bracelet! Cute jewerly!!! I'm a follower of your fun, happy blog! I like the "Dear Rose" belt and the Stitchen It gloves! I love the bow on top belt!! I love the Set Sail Satchel! I follow your blog via GFC!! Also, I follow your blog via GFC! Oh my goodness what would I NOT buy! really!? I love the A-bow-able Bracelet though, so cute!! I love the Opulent Dreams Ring in Pink. Liked them on FB and told them you sent me! I like the Perfect Day ring. I liked their FB page and wrote on their wall! Ooh I'd get the Blooming Floral Scarf! Or the Feathering Around Belt. Or the Statements of Lace Necklace. So many pretty things! I liked their Facebook page! And commented that you sent me. Hard to choose but I think I would go with the gems of emerald necklace. I'm a GFC follower of yours of course! I love the diamonte Rossa ring! i'd use the gift card towards the Set Sail satchel! i already like Le Mode on FB. Wrote on their wall just now! following your blog publicly via GFC! following your blog via Bloglovin' also! Oh yay!!! Love Le Mode. I would get the Love All Around Necklace. So perfect for Summer. Liked them on Facebook and said hi. i simply love the truest love earrings! Too much cute stuff to choose from! I like the scarves. The Blossom Beauty Ring is cute! And I really really like the Descanso Garden Necklace in Mint! I'd get the love notes clutch. I love the abstracted necklace! So gold and gorgeous! I like le mode's FB page! I also follow via bloglovin! totally would by the set sail satchel!! Love the Sunny Side Satchel! Love the Glimmering Light earrings! OMG remember that time i copied your big woven bag from le mode....and then that time we both bought the same green bag from le mode? i freaking love this store. SO - as my first entry, I follow you on GFC obvi! i follow both of ya's on twitter! Liked Le Mode Accessories on Facebook and left a comment on their page. Followed @muchloveilly and @ShopLemode via Twitter.